Here is a fabulous new collection of dies and co-ordinating stamps that work perfectly together and produce fantastic results. The Time Traveller collection features heavily on industrial cogs and pipes to create a realistic steampunk theme. This set of six dies and nine coordinating A6 stamps are going to take your crafting to a new level of crafting! 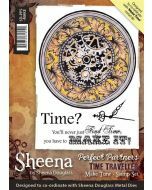 This metal die is designed to co-ordinate beautifully with 'Make Time' A6 Perfect Partner Time Traveller unmounted rubber stamp by Sheena Douglass.